...that the Cabal Exclusion Zone on Mars was devastated by the Warmind Rasputin's orbital weapons shortly before the Guardian first arrived on the planet? ...that humans colonized most of the Solar System during the Golden Age? Skyburner's Oath is an exotic energy Scout Rifle in Destiny 2. It is a wieldable version of the Cabal Slug Rifle. 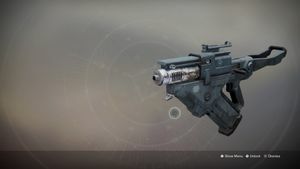 It is a slow-firing, but fully-automatic scout rifle with the capability to penetrate and break Cabal Phalanxes' deployable energy shields. The Skyburner's Oath has an almost unparalleled flexibility due to its twin fire rates and high damage. It has an amazing amount of stopping power, not only in PvE, but also PvP. In PvE, not only does its perk "For the Emperor" make it incredibly useful for negating Phalanx shields, its other perks (which you can see below) all mix to create a hard-hitting, fast-firing, darkness-slaying machine. In PvP, you can shoot down a target with amazing accuracy and damage or you can get up close and hip-fire with the weapon to spray down opponents with the tracking solar slugs. Essentially, whether it's PvE or PvP, the Skyburner's Oath allows you to play things your way no matter what. Its Catalyst also gives the weapon an amazing boost, if you're lucky enough to have it drop from any raid encounter. (Except the Castellum) Once you do obtain the catalyst, you need 1,000 Cabal kills then it will grant +30 range to the weapon. Beware the Red Legion - Equip this Weapon Ornament to change the appearance of Skyburner's Oath. Calus's Promise - Equip this Weapon Ornament to change the appearance of Skyburner's Oath. Slug Rifle: This weapon lobs large, explosive, seeking solar slugs when you're firing from the hip. When you're aiming down sights, the slugs travel fast and straight, with higher damage and a lower rate of fire. For the Empire: This weapon is Full Auto, does extra damage to Cabal, and penetrates Phalanx shields. The lore of the gun is a text from a soldier in the Skyburners. He considers their survival after the fight with the Guardians as victory (as the gun says "victory or death", not dying must be a form of victory), as well as putting trust in Ghaul and is convinced that his legion will put an end to humanity. The lore itself references the lyrics of "Fortunate Son", by the band Creedence Clearwater Revival.